Chris Bruun was born 9 Aug 1929 in Finland. He emigrated to Canada with his brother arriving in Montreal on 1 Jul 1951. He worked as a construction labourer in Northern Quebec before moving west to Edmonton in 1952. He was staying at Immigration Hall when he noticed a job opportunity at the Eldorado Mining Company in Port Radium at Great Bear Lake in the Northwest Territories. He took up photography when he discovered the mining company had a darkroom in their recreational facilities. Mr. Bruun is a self-taught photographer learning from books, trial and error and conversations with the owner of McBain Camera in Edmonton. His first camera was a Rolleicord followed later by a Hasselblad 1000F. In 1955 he gained darkroom experience working with well-known photographer Bob Cantelon with whom he became great friends. Eventually Mr. Bruun embarked on his own professional photographic career specializing in commercial and advertising photography. He worked for firms such as Imperial Oil, Syncrude and Travel Alberta. He also provided images for film-maker Albert Karvonen who became a good friend. Since his retirement Mr. Bruun has turned his camera on various subjects of interest to him. Moving into the digital world has allowed him to continue in the creation and processing of the photographs and experimenting with various techniques. Chris Bruun began donating photographic prints to the City of Edmonton Archives in 1995 and continues to add to the collection in print and digital formats. He continues to be a prolific photographer in his retirement, often photographing skylines from the balcony of his 14th floor apartment in the Oliver area. 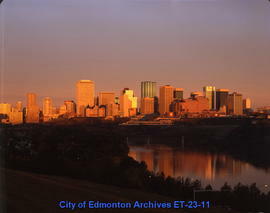 The fonds consists of photographs of people, nature, weather, buildings, street scenes and events in Edmonton, as well as some self-portraits and still lifes. Of special interest are sequential photographs of storms and weather events, as well as building demolition and construction, notably the Molson’s Brewery building on 104 Avenue. This fonds was donated to the City of Edmonton Archives by Chris Bruun in ten donations from 1995 to 2014. The material was arranged chronologically. The photographs were assigned item numbers with the prefix EA-784 and ET-23.